Sometimes time spent at work can feel redundant. And repetitive. At a time where resources are scarce, time is limited, and decisions need to be made quickly, the number of chefs in the kitchen actually seems to be on the rise. 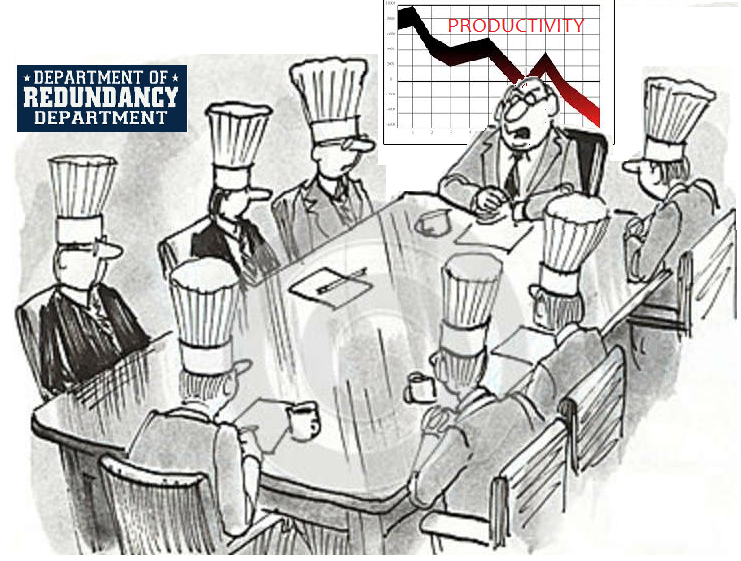 On one hand, we might feel the full brunt of the resource squeeze as we work too many hours, fight for budget, and deal with shrinking staff sizes, but on the other we can feel an overwhelming onslaught of bureaucracy, meetings, and overlap. While we may not have enough resources in our labs and in our cubes to actually do the work that needs done, there seem to be managers, consultants, and other interested parties crawling out of the woodwork to talk about the work when a decision needs to be made. We have a scarcity mindset on our teams conflicting with an abundance of “help” around us— leading to a Redundance Mentality in our organizations. This sounds crazy but it’s real. As resources decrease and expectations increase, there is an exponential rise in pressure on an organization. And this increase in pressure often yields two by-products that can be utterly destructive— Fear and Distrust. Fear will cause an increase in rules and regulations, a reluctance to loosen the reins and take risks, and a hesitation in decision making. Distrust will yield micromanagement, disempowerment, and disgruntled teams who feel that their ideas, their space, and their freedoms are being stifled. And together, at a time where we need to maximize the output and productivity of an increasingly smaller and more efficient workplace, we instead see dramatic decreases. While each individual may be working more hours and demonstrating more activity than ever before, too much of this energy is spent on the checking of each other’s work, internal debating, and elevation of decision making rather than on the delivering of real progress and results. Our efforts are increasing, our outputs are decreasing, and our teams are suffering. So what do we do about it? We choose to stop being redundant. 1) Invest only where you Uniquely Deliver Value. If you, your boss, and your boss’s boss are all in the same cross-functional meeting or on the same email chain then likely two of you don’t need to be there. And sometimes all three of you. If two or more teams are working on projects that have largely the same goals and deliverables, then redundant teams should be disbanded or refocused. Don’t enter into teams, meetings, or email debates in which you personally cannot add distinctive perspective, experience, or value. Trust the smart people around you to play their positions, don’t take the field when you are not needed, and treat your time as an investment of your most precious resource— and maximize that investment. 2) Delegate your Stamp of Approval. One of the key challenges in trying to empower people is when an overly hierarchical organization around you does not recognize an individual’s authority unless he or she has the appropriate stripes. In this case it takes more than a decision to send a delegate in your place to a meeting, or an internal agreement between you and this person to empower your approval. You need to communicate broadly this delegation of authority, enforce and support your person’s decisions, and maintain the discipline to stick to your delegating guns if someone with higher stripes tries to redundantly drag you into the fray. While a symbolic gesture, I just went online and purchased stamps with my initials to literally delegate my stamp of approval to the leaders in my organization. I am physically handing over my trust and authority while clearly demonstrating to the external hierarchies that my decision making is fully entrusted into these individuals’ capable hands. The act of empowerment is a critical first step, but a deliberate and outwardly demonstrated delegation of accountability and decision-making power is necessary to take this empowerment from a concept to a reality. 3) Let Go in Mind, Body, and Spirit. When you decide not to invest in a particular project or topic, whether through delegating your authority or through deciding not to invest your time there, then disengage entirely. Don’t read the emails on that topic and delete them. Remove the meetings from your calendars. Don’t spend an ounce of energy worrying about it or keeping tabs in the background. Communicate broadly the role that you are choosing not to play, and then actively disengage. If you choose to delegate, empower that person fully not just in the work itself but also in the authority. Declutter your mind, remove your physical presence, and free your energy to actively maximize your focus where it is most needed— and not where it is redundant. Obviously the above practices cannot work in 100% of situations, but exceptions to the rule should truly be exceptions if we hope to overcome this Redundance Mentality. We must trust our people, empower them to lead, and overcome the fear of failure that is rampant in so many organizations. If not, we will overwork our teams with non-productive activity, we will stifle our organizational culture, and we will fail to deliver results— again and again. And again. This article was right on so many levels in big and small corporations. Thanks, Nate. Sad but true that there are far too many people feeling both overworked and underutilized. Trust, empower, divide, and conquer- it will lead to bigger results, higher efficiency, and an inspired culture.